I can not charge. Charging is impossible because charging is done and the USB is inserted and the sound is turned on for a long time. However, even if it is used on the Rear side, if you use it (such as catching on footpeg etc etc. ), I think that forgetting to remove will not happen. It's reliability as I expected. Before use, I think that COSPA is good. However, it is unknown what to use the attached bag. Disk Lock is not entered, and if it is a key holder it will be Large rinse. I'd like to make it a bag with Disk Lock if possible. Brand and seeking a sense of security. First of all it is heavy in appearance and leads to a feeling of security. Yet, it's Compact so it's handy to carry. Since Cable is also attached, there is no need to forget to remove and run. The sense of security at the destination increased. The point that can not be locked unless it points to the key is not good. Also Cover of the keyhole is also difficult to fit exactly. I want you to be lockable just by pushing in the unlocked state. KOMINE LK-114 Reminder Disc Lock With reminder, easy to use it so good.But plastic parts of key hole Cover are stuck with adhesive Whether the adhesion area is too small. 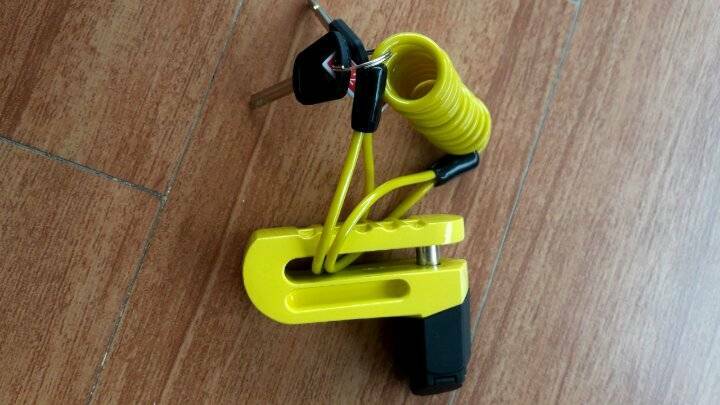 Very Reasonable and Effective I bought this cheapest one among the same type lock. Although it is inexpensive, although the construction is solid, the lid has been taken off, it has become quite easy to take a habit while re-attaching it several times, so I removed it. The color is yellow "I am with you" It is good to have an assertion of. Locking behavior No problem at all, to prevent forgetting to remove Coil type Lock wire is used in combination. I carry the attached Porch with it attached to the car body. It can be recommended as the most convenient Security for the body. Cospa Good! I purchased Motorcycle and introduced it for anti-theft measures, but overall the quality is good and I am satisfied. It takes a long time to reach the lock, it is easy to use for a little theft measures at the destination, it is a dish that can be Recommendation. However, one, the Rubber lid of the keyhole is a little hard to be fixed, only that is disappointing. However, considering Large Kimono, price and effect, it has so much Merit that it does not matter so much.